What does Captain Tony do when the weather in Alaska is bitter and everyone up there is hibernating? Among many other things he works in a few visits to places where Wild Alaska Salmon and Seafood is sold. 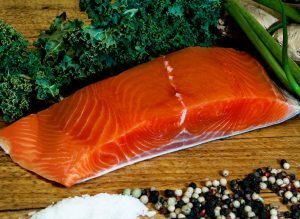 More and more Farmer’s Markets and buyers groups like the “Fish Parade” in Atlanta, come to depend on Tony’s visits with his trailer of wild Alaska salmon. When he did his last trip South, he was interviewed about his involvement at the Chattanooga Farmer’s Market on the occasion of the opening of their market season. Captain Tony, Heather, little Max, their dog and the crew are now getting ready to go back up to King Salmon Alaska for the start of salmon season. Here what Tony had to say.